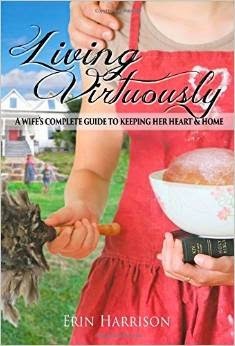 Erin Harrison recently released a book, Living Virtuously: A Wife's Complete Guide to Keeping Her Heart & Home, that was endorsed by Michelle Duggar. We are partnering with Erin to give you a chance to win one of four copies. I highly recommend Erin Harrison's new book, Living Virtuously. Erin is an energetic wife and mother who has a heart to encourage young mothers to train their children to love God and to have a ministry mindset." Follow the directions on the Rafflecopter widget below to enter the giveaway. The book is available for purchase on Erin's website and Amazon. I hope to win a copy! Erin's book is amazing! I read it and loved it. If you want to learn more about being content at home, how to homeschool, and how to keep a clean home, she is the one to learn from. She has 5 children, health problems, loves her husband, yet she keeps her home clean and tidy! I love learning from her. So excited about this book. Without having read the book, the cover makes it seems like it's trying to bring back the dated stereotype that a woman's job is cooking, cleaning and keeping her husband happy. It's kind of sad that the chosen depiction of a "wife" is someone who carries around baked goods and feather dusters. Erin, my 16yo daughter is loving your 'Living Virtuously' book, giving me reports on it daily, & told me to sign up for this after she had. Thanks for the giveaway! Hopefully I did it right! Looks like a wonderful read. Would love to win! Wonderful that you are doing a giveaway of Erin's book! Been a fan since you only had 14 kiddos! does she read those books? what minstry does she support? can you please tell us? I don't know if I did them all right but I hope I did. If I didn't I'm sorry. I would love to win and read this book.Thanks for the chance. Duggars Return in 1 Week!